By virtue of the quirky way the NHL decides tie games -- with a skills competition that rewards the team that loses -- the Washington Capitals have completed a steady climb into playoff position. The Capitals won a shootout to beat the Islanders 2-1 Thursday night, moving Washington atop the Southeast Division. 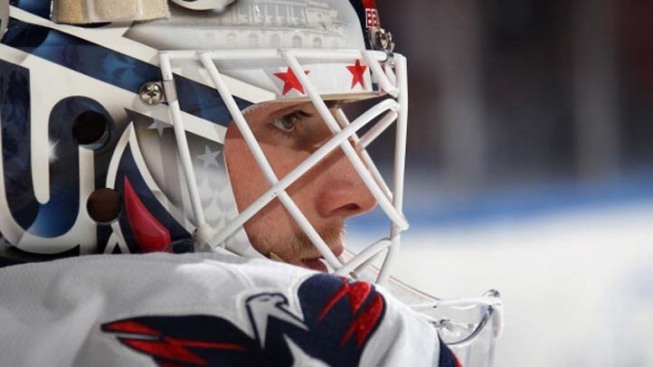 "It's been a tough season in that aspect -- always looking up,'' Holtby said. "We all knew we're capable of (being) where we should be, and that's at the top. You know, this last little while we've all focused on what we need to do, and that's be successful. And we knew if we do that, we'll be where we want to be at the end of the year." Holtby was stellar, with fans chanting his name when he denied Frans Nielsen and John Tavares in the shootout and got a break when Brad Boyes lost control of the puck while skating in on net. Making his 10th consecutive start, Holtby needed seemingly every reflex he had, whether it was sliding left to blunt Keith Aucoin's attempted tap-in at the edge of the crease in the first period or sticking out his right pad to thwart Andrew MacDonald's blast during a four-on-four sequence in the second. Evgeni Nabokov was Holtby's equal, making 21 stops. Kyle Okposo's one-timer with 4:59 to play in regulation forced overtime and assured that both teams would emerge with something. Meanwhile, the New York Islanders picked up a standings point and benefited from the New Jersey Devils' 1-0 loss to the Boston Bruins. In the New York metropolitan area's three-way race that takes up the middle of the standings, the Islanders have won five of seven games and stand at 40 points, while the Devils and Rangers each have 39. The Islanders are trying to make the playoffs for first time since 2007, which also happens to be the last time the Capitals weren't in the postseason. Mike Green scored on a wrister from the right circle with 13 seconds remaining in the first period for the Capitals, and Alex Ovechkin was the only player from either team to find the net in the shootout. Green has five goals in his last four games.